This Knight Rider Kids T-shirt features Kitt with the slogan �Kitt Happens.� Our Knight Rider Kids T-shirt is an incredible 100% preshrunk cotton youth t-shirt for any Knight Rider fan. 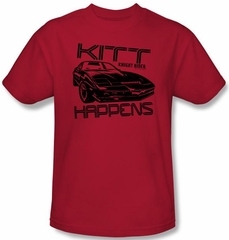 Knight Rider is an awesome television series starring David Hasselhoff. Available in Toddler sizes: Small (4), Medium (5/6), & Large (7)! Also available in 2T, 3T & 4T!